Following is a personal history of the Beaverdam Reformed Church, excerpted from the obituary of Frederick Bassler who died on the 5th of November, 1851 at Berne, Albany Co., NY, in the 99th year of his age. Mr. Bassler lived in the Town of Knox, two miles north of the village of Berne. The church stood on a knoll half way between what is now the villages of Berne and West Berne, now the site of the Beaverdam Cemetery [Harold Miller]. "In 1771, in consequence of the great distance that many were obliged to travel for the purpose of attending divine service and catechetical instructions, the congregation of Schoharie was divided and a new church organized, styled the church of Beaverdam. For the spiritual advancement of this portion of the Master's vineyard, a log house of worship was immediately erected two miles west of Mr. Bassler's residence, where the services were conducted in the German language, affording many a far more easy access to religious ordinances than they had previously enjoyed. Yet these were emphatically times of trouble. While fearing the attack of foes there was no less dread of the cruelty of enemies rising up from among them. The tribes of the Lord go up to his temple for worship, bearing with them the instruments of death. The clangor or arms, and the thoughts of war and bloodshed are mingled with the sacred duties and devotions of the Sabbeth. The communicant carries with him his musket, as indispensible requisities to his attendance upon the ordinances of religion. Being at any moment liable to an attack, it was necessary at all times to be in readiness for defence. But after the lapse of years, these difficulties subsided, and the hearts of the faithful were encouraged to the performance of a more vigorous service. [This was in 1786.] Now this crude and ancient building is removed, and a more convenient, large and comfortable edifice is erected in its stead. Here for many years Mr. Bassler met and communed with the people of God." But when in process of time this second temple grew old and dilapidated, and the village of Beaverdam on the west [West Berne], and Berne on the south were increasing in population, it was deemed expedient to abandon the old church ground and erect a new house of worship in each of the above villages. Accordingly, this project was entered upon, and both of these houses were commenced and completed in 1831. Mr. Bassler being set off, identified with the First Reformed Dutch Church of Berne. In 1789 his name is enrolled as a member of consistory, and from that time until disqualified for the active duties of life by the weight and infirmities of age, he was an active, efficient and exemplary member, and much of the time a ruling leader in the church of God. 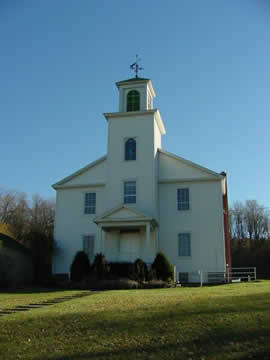 When the old church of Beaverdam was originally formed from a portion of the congregation of Schoharie in 1771, Mr. Bassler constituted one of its members. Since then, that entire body have fallen asleep. This aged father in Israel survived them all. He was the last living member of that organization. That then active branch of our beloved Zion is now numbered with the things that were. What a thrilling comment upon the evanescence of all sublunary objects! Life, however protracted and years, however multiplied, must speedily be brought to a close.The time is at hand when it shall be said, - They were but are not.